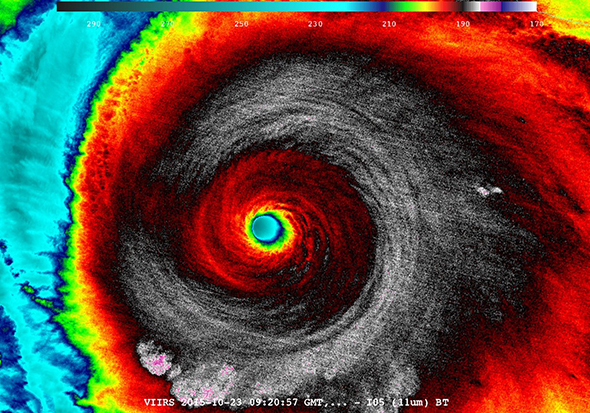 Hurricane Patricia, 2015. NASA satellite image. Inspired by Hito Steyerl’s video Liquidity Inc., the exhibition This Is The Sea, looks at several metaphoric imports of the concept of the sea. It is a gathering of artworks which connect the ungroundedness of the sea and its shifting and often unsettled surface to the political, technological and natural destabilization of the planet earth. Extending Steyerl’s inquiry into the financial, environmental and personal implications of the concept of liquidity, the exhibition tracks the aesthetics of the tumultuous storms which have battled the form and content of “life according to the 20th century,” destroying its very material fabric. This Is the Sea also looks critically at seasteading as the utopian project of the privileged class and the desire of millennial entrepreneurs to turn the waterways into the container of their floating private city-states. The idea of seasteading is based on the societal need for radical experimentation with better physical habitats and their corresponding legal & political systems. Seasteading is the dream of utilizing the liquidity of earth’s water supply and its ambiguous political status towards the development of a new human “frontier,” a form of space colonization here on our own planetary home. This Is the Sea is an experiment in extending the logic of the sea to the realm of contemporary art. It utilizes the spatial potentials of a floating yacht to try to set art free from its experiential dependence on land and land-based institutions. The project looks at both the destabilizing dreams and nightmares caused by the sea and the erosion of situatedness and positionality brought on by environmental technological and political storms. It utilizes the no jurisdiction status of a yacht as a display and discursive space in which art can be situated and experienced in order to reflect on our contemporary conditions.